I am so very very sorry to have to tell you this, but you see. I lied like a rug. I was so untruthful with you all that I feel the need to shower. Really, it is HORRIBLE what I have told you - and how wrong it was to do that to you. I want THIS for Valentine's Day. What? I got a enamel dutch oven for Christmas last year. Why not? Hello Big, Deep, Dark and Handsome. That is nice..i would want one too..cuz like you, I already have everything...Hope you have a great one..! 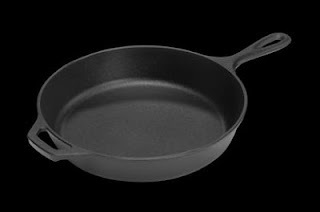 I'm dying for a cast iron skillet! We always just borrow one from my inlaws.